Spectaculair laadproces van Veka casco’s from VeKa on Vimeo. Paddle Steamer Preservation Society Website with reports and photos from recent trips on the PS Waverley. LiveLeak.com – Pacific Sun Cruise liner in very heavy seas. Internal CCTV footage. LiveLeak.com – Pacific Sun Cruise liner in very heavy seas. Internal CCTV footage..
clydemaritime.co.uk has been updated. Just 4 weeks after it’s launch we now have over 320 members and have some new sections. Come along and pay us a visit for all things related to Clyde Shipping . Being launched tomorrow – www.clydemaritime.co.uk – a new web forum dedicated to shipping news from the River Clyde in Scotand, plus the rest of the UK and beyond. Nice selection of ships in stormy seas, taken from a French film, apparently. 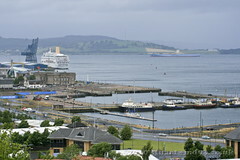 P&O’s cruise ship Oriana at Greenock Ocean Terminal with Maersk Brooklyn in the background, and some of the Clyde Marine fleet in the Victoria Harbour in the foreground.